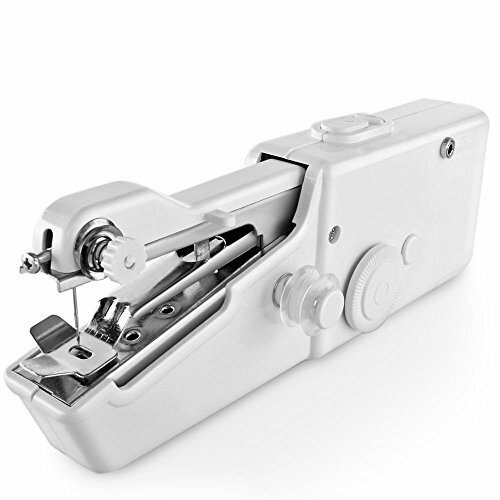 The hand held sewing machine compact and portable; excellent for on-the-spot repairs and is lightweight and powerful. Repair drapes without taking them down; repair clothing without taking it off; repair bedding without stripping the bed and so much more. This battery operated machine is great for silks, denim, wool, leather and crafts. Requires four AA batteries or a power adaptor (neither is included). This package contains the sewing machine, bobbins, needles, thread spindle, needle threader and complete instructions. Note: Click the power button several times can make the sewing machine to restore the correct position. When the sewing machine is unable to start, turn the rotary wheel and push power button at the same time until it can run. Read the included user instruction before use it.